BATTLE RUNES: Writings on War is now available. (28% off list price - Barnes & Noble online! - ask about our discounts!) 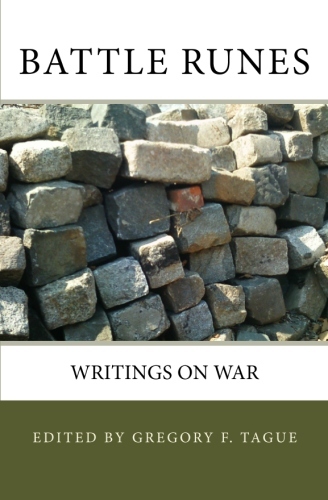 The book consists of twenty-one authors – thirty-seven works (short stories and poems) from all over the world – writing about the physical and psychological ravages of war on individuals and families. Parts of the book are shocking and horrifying, but in the end there is hope. Muhammad Ashfaq; Thom Brucie; John Gifford; John Guzlowski; Alamgir Hashmi; Margaret Kingsbury; Geoffrey A. Landis; Mitch Levenberg; Hunter Liguore; Mira Martin-Parker; Rebecca Newth; Norah Piehl; Nahid Rachlin; C.R. Resetarits; Nancy Riecken; Dawn Sandahl; Lisa L. Siedlarz; Lisa M. Sita; Patty Somlo; Marko Vešović; Jenny D. Williams. ISBN: 978-0982481943. 186 pages, paperback. January 2011. $15.95US. Amazon/B&N online – Ask your local Bookstore (Distributed by Ingram). Google e-Bookstore (future).